Mona B Wild Streak Canvas Tote Bag| P.C. Fallon Co. The Wild Streak Canvas Tote by Mona B. can never be tamed. 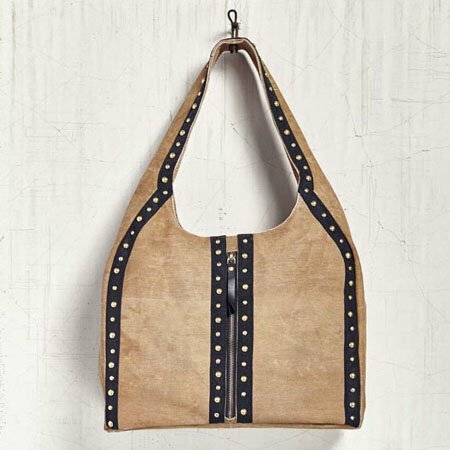 The color combination of coffee-hued canvas with black grosgrain trim and gold studs is irresistible. Front and center is a functional zippered opening with black leather pull. The wide shoulder strap is one-piece with the bag, and offers an 11" drop for chic shoulder wear. Dimensions are 12"w x 14"h x 7"d. Made from recycled antique military tents and tarps. The fabric shows the history of its travels. Color variations and patches add to the uniqueness of each bag. Heavy cotton canvas trimmed with ribbon.